West Cancer Center currently has 10 open trials studying breast cancer, including drug trials, pre-clinical and observational research to better understand how to help the almost 10,000 breast cancer patients who are treated at West and millions of other patients in the United States. Since 1980, West Cancer Center developed from a private practice to a multidisciplinary cancer treatment with research and treatment together. Over that time, West has seen a 20 percent increase in new breast cancer cases. It currently employs eight researchers. One of every eight women develop breast cancer and according to Ari VanderWalde, MD, MPH, MBioeth, Director of Research at West Cancer Center, the facility sees approximately 1,000 new breast cancer patients annually. According to Dr. VanderWalde breast cancer is unique from other cancers in that it is quite therapy extensive. Unlike prostate cancer, which is often handled by a surgeon, breast cancer usually involves a team of specialists. The team model is why VanderWalde says a treatment center such as West is ideal. "Multispecialty clinics with medical oncology, radiology and clinical research improves the patient experience," VanderWalde said. "Whatever is available for that patient anywhere is available,"
Drug trials are an important part of West's research strategy, and this year the drug Nerlynx (chemical name: neratinib) was approved. It treats a subset of breast cancer called HER2-positive "by blocking the cancer cells' ability to receive growth signals" according to BreastCancer.org. Another trial involves immune therapies and PARP inhibitors. These drugs would use the body's own immune system to attack the cancer cells and disrupt the disease's ability to make mutations. While new surgical techniques are not currently being researched at West, there are surgical trials with the National Cancer Institute to determine which combination of surgery and radiation are most effective. Dr, VanderWalde said breast cancer research has shifted away from surgery technique study, with the new focus on the combination of drug treatment and surgery. Another current trial involves cryotherapy or cryoablation with the company Ice Cure. 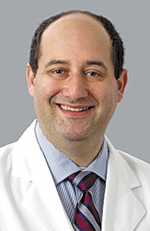 Richard E. Fine, MD, FACS is the lead investigator studying how the extreme cold can kill or freeze cancer cells in early, stage 1, patients. The procedure ablates (destroys) tumors up to 1.5cm, helping some patients avoid surgery. After the tumor is destroyed, the cells are slowly absorbed into the body and the mass recedes. Ice Cure is in testing with several clinics to test the IceSense3's capabilities to treat cancer. If cryoablation is successful to treat breast cancer, it would be less costly than surgery, and leave minimal cosmetic impact. Across all three areas of research, quality of life is an important aspect of all trials. Studying ways to prevent or treat nausea for example or preventing infection are important to improve the patient experience with treatment, according to Dr. VanderWalde says West is looking for ways to make breast cancer less disruptive for patients. Dr. VanderWalde believes the most promising aspect of breast cancer research is tailoring therapy to each patient. "Breast cancer is very complicated - what's really exciting and interesting to me is to see breast cancer not just as one disease, but an individual disease that needs to be treated on an individual level. Tailor therapy to each person - and that's what I think is coming. That's things such as molecular and genetically targeted therapy and personalized medicine." Precision oncology, targeting cancer on the cellular genetic level, is being studied at West by the tumor's molecular abnormalities, looking beyond the disease type, to try to better understand the biology of cancer. As the second most common cancer among woman in the United States, advances in breast cancer treatment can have a major impact.